The newest sport hitting Russia is slapping people silly. Literally. The first-ever “Male Slapping Championship” took place in Siberia and the result was, well … see for yourself. This is truly a mismatch of styles. Dude in white is bringing the traditional, bog-standard slap to the table and it’s clear how bad an idea that was. 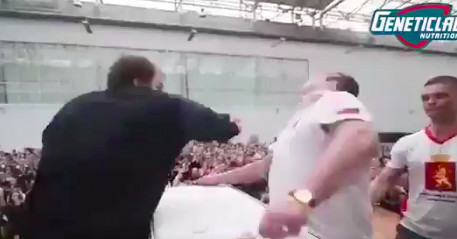 I’m not going to say that beard guy was cheating here, because I’m not a sanctioned slap judge (also I would not like to be slapped by him), but this is clearly a punch-slap hybrid that used plenty of wrist power to deliver the blow. Dude in white didn’t stand a chance against this slap assault. It ended up winning beard guy a cool 30,000 rubles ($466). I don’t know if I’d endure this kind of punishment for $466, but I’m also averse to the idea of being slapped in the face. Now, please enjoy more highlights from the competition.